One of the most commonly performed surgical procedures by oral and maxillofacial surgeons all over the world is the removal of impacted teeth. Impacted teeth are present in approximately 20% of the population, where mandibular third molars are the most common. Third molar surgery may range from relatively easy to extremely difficult. Depending on the complexity of procedure, response of patient varies on postoperative pain, swelling, trismus, and paresthesia. Another newer technique for osteotomy is the application of piezoelectric devices. Piezosurgery is an innovative technique that has been introduced as an alternative to overcome the drawbacks related with the conventional rotating handpiece. The main advantages of piezoelectric surgery are the precise cutting of hard tissue and protection of the soft tissue, including nerves and blood vessels, less vibration and noise, and a better view of the operative field. Piezoelectric devices have been effectively utilized for many oral and maxillofacial procedures, such as sinus lifting, harvesting of autologous bone graft, bone splitting, lateralization of the inferior alveolar nerve, and orthognathic surgeries. Piezoelectric surgery has its advantages in periodontology and endodontics. In ENT and orthopedic surgeries, piezoelectric device permits faster and easy intraoperative management, and precise cutting, particularly in crucial anatomical areas, but the system is not very efficient for deeper cuts. The aim of this study was to compare the surgical outcome of third molar surgery using conventional rotary handpiece and piezotome with all other criteria remaining same for all the subjects. 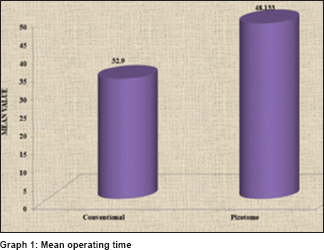 The objectives included are as follows: (1) to assess the usefulness of piezotome in third molar surgery, (2) to compare the time taken for surgical extraction of third molar using a conventional handpiece and a piezotome, (3) to compare overall surgical outcomes such as postoperative pain, edema, trismus, paresthesia, and incidence of alveolar osteitis following third molar surgery using conventional rotary technique and piezotome. 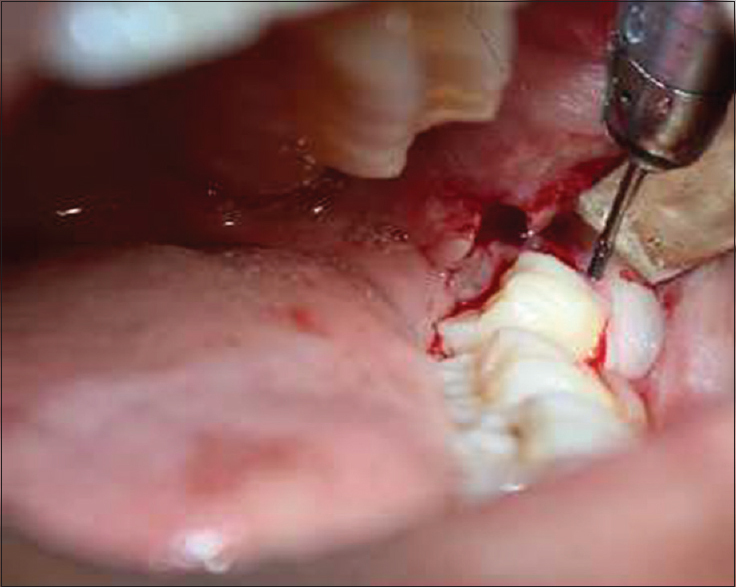 This study was conducted to compare the surgical outcome of impacted mandibular third molar surgery using conventional handpiece and piezotome. The study design was a split-mouth, comparative, cross-sectional study. Data analysis was done using unpaired t-test. A statistical package SPSS version. 17.0 (SPSS Inc., Chicago, IL, USA) was used and P < 0.05 was considered as statistically significant. The study population comprised patients reporting to the Department of Oral and Maxillofacial Surgery for surgical extraction of impacted mandibular third molars. With 95% confidence level and 90% power, the sample size of 30 was taken for the study. Inclusion criteria were as follows: (1) patients requiring surgical removal of bilateral impacted mandibular third molar with appropriate indications for the same, (2) patients with same Pederson difficulty index for bilaterally impacted mandibular third molars, (3) patients who were in good physical health with no clinically significant and relevant medical history, and (4) patients who understood and were willing to follow with all study procedures. Exclusion criteria were as follows: (1) patients unable or unwilling to sign the informed consent form, (2) patients with a history of allergy to the drug given during the course of the treatment, (3) immunocompromised individuals including those with severe debilitating diseases, (4) patients suffering from a hemorrhagic diathesis, (5) patients having a past history of deep vein thrombosis or current use of anticoagulants, and (6) pregnant, lactating, or female participants taking oral contraceptives were not included in the study. The study was conducted after obtaining approval from Institutional Ethics Committee of Manipal College of Dental Sciences, Mangalore and was conducted for 23 months. Side B – Conventional rotary handpiece. All the patients reporting to the department of oral and maxillofacial surgery for impacted third molar removal were screened. The angulation, depth, ramus relationship, root morphology, and relation to inferior alveolar canal were assessed. A total of “30” patients with same Pederson difficulty index for bilateral impacted third molar were selected for the study. After obtaining written informed consent, patients were scheduled for bilateral third molar surgery in two sessions, with 1-month interval inbetween. The third molar surgery on one side was carried out using piezotome. 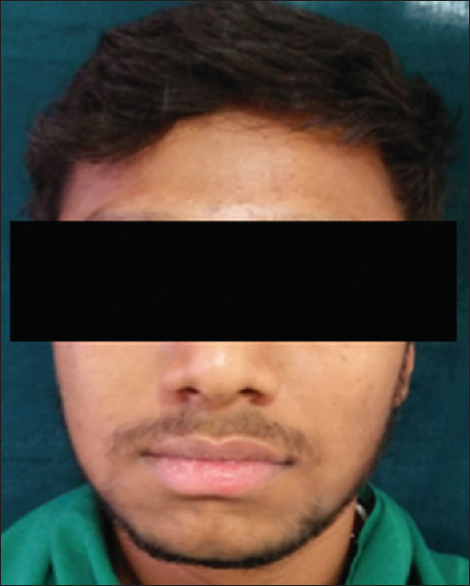 The patients were scheduled for the next third molar surgery of contralateral side using conventional rotary handpiece after 1 month of first surgery. For the purpose of data collection, patients having bilateral mandibular impacted teeth were divided as Side A and Side B. Side A comprised patients for piezotome and Side B comprised of patients for rotary bur technique. All patients were operated by the same operator to minimize differences due to operator variability. Each patient was given a prophylactic medication of 1 g of amoxicillin (500 mg) 1 h before the procedure. Starting with the procedure, 2% lignocaine hydrochloride with adrenaline in 1:20, 0000 dilution was used for inferior alveolar, lingual, and long buccal nerve blocks. A modified ward's incision was made to reflect the flap. A mucoperiosteal flap was raised using periosteal elevator (Molt's Number 9) to expose the tooth and surrounding bone. Bone guttering and tooth sectioning were done using rotary bur or piezotome as planned. For Side A, piezotome was used for bone cutting on the buccal and distal accept depending on the nature of the impaction [Figure 1]. Tooth sectioning was done if required. 0T2 and 0T7 inserts of piezoelectric device were used. The vibration frequency was maintained between 28 and 36 kHz and microvibration amplitude ranging from 30 to 60 um/s. For Side B, a conventional rotary handpiece at 35,000 rpm, a straight fissure bur (SSWHP-560) in straight handpiece was used for bone guttering under copious saline irrigation [Figure 2]. Sectioning of the tooth was done using a straight fissure bur when needed. After the removal of the tooth, the extraction socket was debrided and irrigated using a combination of povidone-iodine and normal saline. Extraction socket was checked for any sharp edges. Sharp margins were trimmed using bone rongeur and bone file. Socket was irrigated again and suturing was done with 3-0 silk suture. Pressure pack was given intraorally. Postoperative instructions were given to all the patients and ice pack was placed extraorally at the surgical site for 20 min. Chlorhexidine mouthwash 3 times a day for 1 week. All the patients were examined on 1st, 3rd, and 7th day and findings were recorded. Responses were evaluated on the basis of time taken for surgery, postoperative pain, edema, trismus, paresthesia on 1st, 3rd, and 7th postoperative days. Both the surgeries were evaluated postoperatively by same team of surgeons who were blinded to the technique used for each case in order to avoid investigator bias. 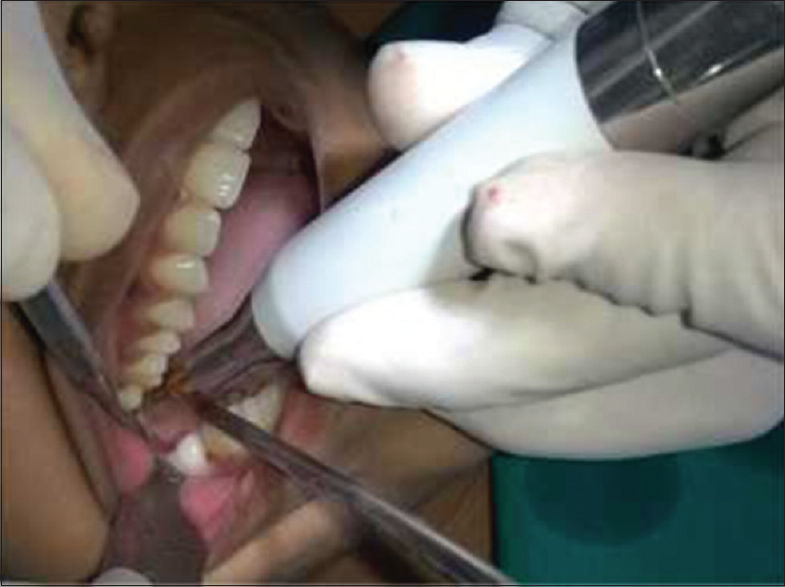 To evaluate and compare postoperative trismus, distance (in millimeters) between the incisal edges of the maxillary and the mandibular central incisors at maximum mouth opening was recorded with a ruler [Figure 3] and [Figure 4]. The horizontal distance between the lower attachment of the earlobe to corner of the mouth and the vertical distance between the angles of the mandible to the outer canthus of the eye was measured by means of a thread. 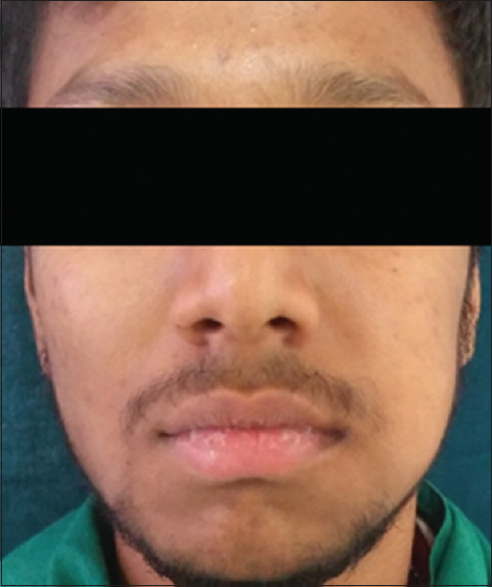 This measurement was done before surgery along the natural convexity of the patient's face as a reference measurement to compare postoperative edema. Time taken for surgery was evaluated from Ward's incision till the placement of the last suture. Postoperative pain was evaluated on 1st, 3rd, and 7th day on a visual analog scale (VAS) of 10 units; 0 – absence of pain, 10 – most severe pain. Total number of analgesics taken till the 7th day after each surgery was recorded. 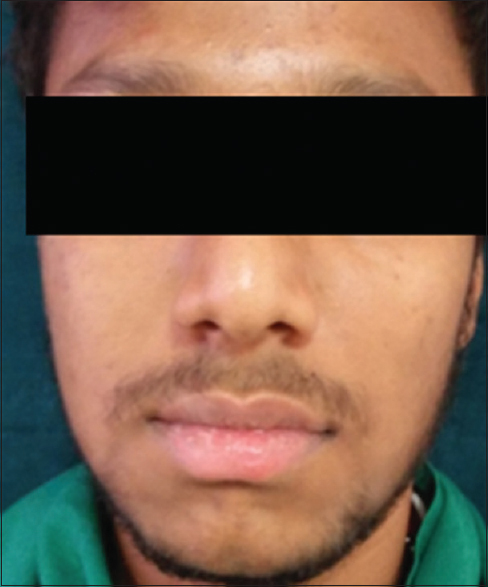 Trismus was evaluated based on the distance (in millimeters) from the incisal edges of the maxillary and the mandibular central incisors at maximum mouth opening on 1st, 3rd, and 7th postoperative days [Figure 5] and [Figure 6]. Edema was evaluated by the method defined by Amin and Laskin [Figure 7] and [Figure 8]. The horizontal distance from the lower attachment of the earlobe to corner of the mouth and the vertical distance between the angle of the mandible to the outer canthus of the eye was measured by means of a thread on 1st, 3rd, and 7th postoperative days. Paresthesia was evaluated using the cotton wool test. Incidence of alveolar osteitis was assessed on the 3rd postoperative day. The difference between the responses of patients on each postoperative visit was recorded and compared. Ethical clearance to conduct the study was obtained from the Institutional Ethics Committee of Manipal College of Dental Sciences, Mangalore. Informed consent was obtained from all the patients before inclusion into the study. Confidentiality of the participants was preserved and was not disclosed. A total of 12 males and 18 females in the age group 20–35 years were included in the study. When each side was evaluated, the following results were obtained. [Graph 1] shows the mean operating time for Side A and Side B. [Graph 2] shows the pain score on day 1st, 3rd, and 7th. 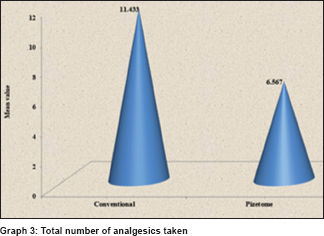 [Graph 3] shows the total number of analgesics taken for each side till 7th day. [Graph 4] shows mouth opening on 1st, 3rd, and 7th day. [Graph 5] shows the edema on 1st, 3rd, and 7th day. There was no incidence of paresthesia in Side A, while there was one incidence of paresthesia out of 30 patients in Side B. There were no incidences of alveolar osteitis for Side A and Side B. In oral and maxillofacial surgery, impacted third molars are routinely extracted and invariably cause certain degree of postoperative pain, swelling, and trismus. The severity of postoperative responses is correlated to the “aggressiveness” of the procedure. In 1975, Horton et al. studied the effects of chisel, ultrasonic instrument, and rotary bur used for osteotomy and compared their effect on postoperative wound healing and reported that rotary burst was more traumatizing to the bone. A favorable healing outcome was observed in chisel, followed by ultrasonic instruments. In 1999, Prof. Tomaso Vercellotti, in collaboration with Mectron Spa, invented a new innovative piezoelectric bone surgery technique. The postoperative pain was evaluated based on VAS. According to our study, there was highly significant (P < 0.001) decrease in postoperative pain from 1st, 3rd, and 7th day with piezotome when compared to conventional rotary instruments. Pain gradually decreased in both the surgeries, but values noted for conventional were higher than that of piezotome. Pain was absent or minimized on the 7th day postoperatively in piezotome side. Barone et al. showed a greater values for VAS with conventional rotary instruments, but their results were not statistically significant. According to study conducted by Rullo et al., there was reduction in pain with piezotome only for “simple extraction” cases, whereas in “difficult” cases, the postoperative pain was significantly higher in the piezotome group. On the contrary, Mantovani et al. concluded that despite more time taken for the surgical procedure, the VAS was lower with piezotome. The number of analgesics taken was significantly higher (P < 0.001) in conventional technique when compared to piezotome. Few patients reported taking analgesics till the 7th day in rotary technique, while in piezotome, mostly no analgesics were taken after 5th of surgery. The reduced postoperative pain and number of analgesics taken were attributed to the minimal damage to the soft tissue caused by piezosurgery which reduces the inflammatory responses. In our study, postoperative edema was evaluated by the method described by Amin and Laskin. Patients were examined on 1st, 3rd, and 7th day of surgery, the measurements were taken from the same landmarks and were compared. 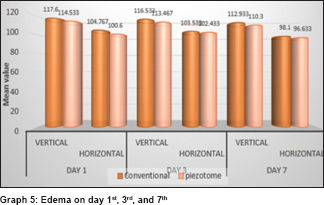 Our results showed that there was no statistically significant difference in vertical distance on 1st, 3rd, and 7th day, while in horizontal distance, there was significant difference (P = 0.014) on 1st day with statistically no significant difference on 3rd and 7th day postoperatively in piezotome side when compared to conventional rotary side. According to the study conducted by Sortino et al., 40.06% decrease in edema was measured in the piezotome group 24 h after the surgery. There was no significant variation in the swelling on postoperative day 7 and 30 in a study conducted by Sivolella et al., whereas Mantovani et al. reported a statistically significant decrease in postoperative edema mostly on the 7th day postoperatively in piezotome group. There was statistically significant (P < 0.01) decrease in trismus in piezotome side on postoperative 1st, 3rd, and 7th day. 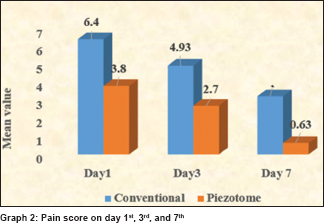 Furthermore, there was faster improvement in mouth opening with minimal or no trismus on the 7th day in piezotome side when compared to the conventional rotary group. Similar to our results, a study conducted by Goyal et al. also showed significantly lower values for trismus in the piezosurgical group on the 3rd, 5th, and 7th postoperative day. Further, a study conducted by Piersanti et al. which evaluated trismus on each day postoperatively showed better values for mouth opening on the 2nd postoperative day. On the contrary, a study by Sivolella et al. showed that there was no significant difference in the mouth opening between the piezotome and rotary side on the 7th postoperative day. According to the study conducted by Oikarinen, operating time has direct effect on postoperative results, that is, pain, trismus, and edema. More the time taken for surgery, higher the chances for increased pain, trismus, and edema. On the contrary, Benediktsdóttir et al. concluded that postoperative results were independent of the time taken for the surgery. We calculated the time taken for procedure from modified Ward's incision till the placement of the last suture. 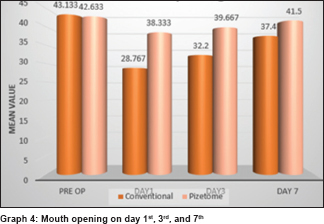 In our study, the operating time was significantly higher in piezotome side than that of rotary side. But despite of longer operating time, the postoperative consequences as pain, trismus, and edema were significantly less for piezotome side. Rullo et al. in their study stated that while performing extraction with minimal difficulty index, the time taken for procedure using piezotome and rotary technique was similar, and there was no statistical difference between the two groups. Furthermore, there was significantly less pain in the piezotome group, whereas, in difficult extractions, time difference was statistically significant with more time required with piezotome. We also compared the incidences of postoperative paresthesia and alveolar osteitis in both the technique. Paresthesia was examined by cotton wool test. One patient had paresthesia in rotary bur side, while none of the patients had any incidence of paresthesia in piezotome side. Paresthesia was resolved completely within 6 months. Patients were examined on the 3rd day postoperatively for any evidence of alveolar osteitis. There was no incidence of alveolar osteitis in both the sides. When we compared the overall outcomes of our study, despite the increased operating time, the postoperative responses such as pain, edema, trismus, paresthesia, and alveolar osteitis were significantly less in piezotome side. Supported by many experimental and clinical studies, piezotome delivers minimum thermal side effects on bone, a smoother osteotomy area, enhanced bone healing, and precise osteotomy design with better control of cutting depth and surrounding soft-tissue safety. The present study concludes that regardless of longer duration of surgery with piezotome, the final outcomes suggested that piezotome is a promising alternative for removal of impacted third molars with minimal postoperative complications. Piezotome could be a boon for better osteotomies if the technique is mastered effectively and used judiciously. We recommend using piezotome for bone cutting and conventional rotary handpiece for tooth sectioning in order to obtain favorable outcomes as well as decreasing the operating time. Further research in this field is required to overcome the shortcomings of piezotome so as to set it as a gold standard for osteotomies in impacted third molar surgery. Juodzbalys G, Daugela P. Mandibular third molar impaction: Review of literature and a proposal of a classification. J Oral Maxillofac Res 2013;4:e1. Yuasa H, Kawai T, Sugiura M. Classification of surgical difficulty in extracting impacted third molars. Br J Oral Maxillofac Surg 2002;40:26-31. Seymour RA, Meechan JG, Blair GS. An investigation into post-operative pain after third molar surgery under local analgesia. Br J Oral Maxillofac Surg 1985;23:410-8. Kerawala CJ, Martin IC, Allan W, Williams ED. The effects of operator technique and bur design on temperature during osseous preparation for osteosynthesis self-tapping screws. Oral Surg Oral Med Oral Pathol Oral Radiol Endod 1999;88:145-50. Maurer P, Kriwalsky MS, Block Veras R, Brandt J, Heiss C. Light microscopic examination of rabbit skulls following conventional and piezosurgery osteotomy. Biomed Tech (Berl) 2007;52:351-5. Salami A, Vercellotti T, Mora R, Dellepiane M. Piezoelectric bone surgery in otologic surgery. Otolaryngol Head Neck Surg 2007;136:484-5. Amin MM, Laskin DM. Prophylactic use of indomethacin for prevention of postsurgical complications after removal of impacted third molars. Oral Surg Oral Med Oral Pathol 1983;55:448-51. Barone A, Marconcini S, Giacomelli L, Rispoli L, Calvo JL, Covani U, et al. A randomized clinical evaluation of ultrasound bone surgery versus traditional rotary instruments in lower third molar extraction. J Oral Maxillofac Surg 2010;68:330-6. Rullo R, Addabbo F, Papaccio G, D'Aquino R, Festa VM. Piezoelectric device vs. Conventional rotative instruments in impacted third molar surgery: Relationships between surgical difficulty and postoperative pain with histological evaluations. J Craniomaxillofac Surg 2013;41:e33-8. Mantovani E, Arduino PG, Schierano G, Ferrero L, Gallesio G, Mozzati M, et al. A split-mouth randomized clinical trial to evaluate the performance of piezosurgery compared with traditional technique in lower wisdom tooth removal. J Oral Maxillofac Surg 2014;72:1890-7. Sortino F, Pedullà E, Masoli V. The piezoelectric and rotatory osteotomy technique in impacted third molar surgery: Comparison of postoperative recovery. J Oral Maxillofac Surg 2008;66:2444-8. Sivolella S, Berengo M, Bressan E, Di Fiore A, Stellini E. Osteotomy for lower third molar germectomy: Randomized prospective crossover clinical study comparing piezosurgery and conventional rotatory osteotomy. J Oral Maxillofac Surg 2011;69:e15-23. Piersanti L, Dilorenzo M, Monaco G, Marchetti C. Piezosurgery or conventional rotatory instruments for inferior third molar extractions? J Oral Maxillofac Surg 2014;72:1647-52. Benediktsdóttir IS, Wenzel A, Petersen JK, Hintze H. Mandibular third molar removal: Risk indicators for extended operation time, postoperative pain, and complications. Oral Surg Oral Med Oral Pathol Oral Radiol Endod 2004;97:438-46.